Dr. Grossman is a Body MRI fellow, Dr. Khatri is an Assistant Professor, Body/Body MRI section, and Dr. Pedrosa is the Chief-of-MRI, Associate Professor, Department of Radiology, University of Texas Southwestern Medical Center, Advanced Imaging Research Center, Dallas, TX. A 45-year-old morbidly-obese male (weight 391 lbs (177 kg), BMI >40) initially presented to an outside institution with an obstructing rectosigmoid mass in March 2009. The patient underwent an abdominoperineal resection in April 2009 (T4 lesion with 1/34 nodes positive) and was then treated with chemoradiation followed by chemotherapy until December 2009. 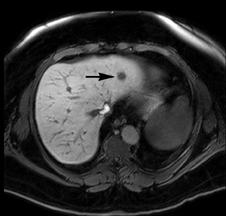 After several follow-up computed tomography (CT) scans without evidence of metastatic disease, an outside surveillance CT in April 2012 identified 2 new liver lesions; only one was confirmed on an FDG positron emission tomography (PET) scan in May 2012. Carcinoembryonic antigen remained within normal limits before and after surgery. The patient transferred care to our institution for consideration of surgical resection of hepatic metastasis in May 2012. The patient underwent a multiphasic CT with intravenous contrast, which was limited by streak and beam hardening artifact from the patient touching the CT gantry, and identified a single heterogeneous indeterminate lesion in the right lateral hepatic lobe (Figure 1). 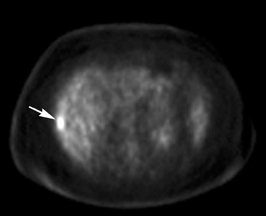 This was the lesion that was seen on the prior PET/CT (Figure 1). Given the patient’s body habitus, an magnetic resonance imaging (MRI) examination of the liver was obtained on a large-bore magnet (Philips Ingenia 1.5T, 70-cm bore), which allows for imaging of patients up to 550 lbs (250 kg). The patient was imaged with a torso 16-element digital phased-array surface coil. A hepatobiliary contrast agent, Gadoxetate disodium (Eovist; Bayer HealthCare Pharmaceuticals), was utilized to increase conspicuity between the normal liver parenchyma and potential metastases.1 Six hypoenhancing lesions consistent with metastatic disease were identified with MRI. While some of the lesions were identified on the T2-weighted, diffusion weighted and/or dynamic post-contrast images obtained during the arterial and portal phases, they were better depicted during the hepatobiliary phase acquired 20 minutes after administration of contrast (Figure 1). The liver is the most common site of metastatic spread in patients with colorectal adenocarcinoma. Almost 50% of patients with colorectal cancer develop metachronous metastasis in the liver at some time after their primary resection.2 New advances in chemoradiation have resulted in improved mortality in patients with metastatic colorectal cancer although surgical resection is still considered the only therapeutic option with potential long-term survival. While the indications for surgical resection of hepatic metastases continue to evolve, the number and location of metastatic lesions remain a critical aspect of the assessment of patients being considered for this therapeutic option. Therefore, optimal imaging of the liver is crucial for pre-surgical evaluation of a patient with colorectal cancer. This case illustrates the technical challenges to adequately imaging a larger patient. 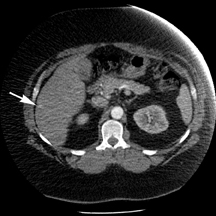 The CT images obtained were noisy and demonstrated some beam hardening artifact generated due to the patient’s abdominal wall contacting the CT gantry. This examination vaguely demonstrated only the largest lesion, which measured 3 cm in craniocaudal dimension. The patient also exceeded the weight and size limit on several MR magnets at the authors’ institution. 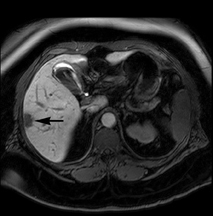 The ability to perform the MRI examination in a large-bore MRI scanner (70-cm wide), with up to 55-cm field-of-view, provided the opportunity to fit this larger patient comfortably and obtain images of the liver with high diagnostic quality. Furthermore, digital surface coils, which directly digitize the MR signal before the images are sent to the magnet, provide an improved signal-to-noise ratio over standard analog surface coils, which may be essential in challenging patients, such as the one presented here. In this large patient, the combination of existing hardware, together with the homogeneous fat exclusion achieved with the optimized mDIXON acquisition,6,7 and the administration of a hepatobiliary agent (Eovist) were critical to altering the therapeutic approach by demonstrating several unsuspected liver metastases. The synergism of state-of-the-art MRI hardware, including a large 70-cm bore, improved signal-to-noise from digital coils, optimized fat exclusion over large fields-of-view using a Dixon-based acquisition (mDIXON), and the use of an hepatobiliary agent (Eovist) were essential in detecting very small lesions in a morbidly obese patient that were not identified on contrast-enhanced CT and PET imaging. This MRI examination was crucial in making a decision about the best treatment options for this patient. Bluemke DA, Sahami D, Amendola M, et al. Efficacy and safety of MR imaging with liver-specific contrast agent: U.S. multicenter phase III study. Radiology. 2005;237:89-98. Quan D, Gallinger S, Nhan C, et al. The role of liver resection for colorectal cancer metastases in an era of multimodality treatment: A systematic review. Surgery. 2012;151:860-870. Tappouni R, Kissane J, Sarwani N, et al. Pseudoenhancement of renal cysts: Influence of lesion size, lesion location, slice thickness, and number of MDCT detectors. AJR Am J Roentgenol. 2012;198:133-7. Ringe KI, Husarik DB, Sirlin CB, et al. Gadoxetate disodium–enhanced MRI of the liver: Part 1, protocol optimization and lesion appearance in the noncirrhotic liver. AJR Am J Roentgenol. 2010;195:13-28. Huppertz A, Balzer T, Blakeborough A, et al. Improved detection of focal liver lesions at MR imaging: Multicenter comparison of gadoxetic acid-enhanced MR images with intraoperative findings. Radiology. 2004;230:266-275. Perkins TG, Van Tilburg JL, Herigault G, et al. Preliminary clinical experience with a multiecho 2-point dixon (mdixon) sequence at 3T as an efficient alternative for both the SAR-intensive acquired in- and out- of-phase chemical shift imaging as well as for 3D fat-suppressed T1-weighted sequence used for dynamic gadolinium-enhanced imaging. Proc. Intl Soc Mag Reson Med. Stockholm, Sweden 2010;18:556. Sims RD, Yuan Q, Khatri G, et al. Multiecho 2-Point Dixon (mDIXON) imaging as an alternative to separate 2D chemical shift imaging and 3D fat-suppressed T1-weighted sequences for gadolinium enhanced imaging. Poster Presentation. Intl Soc Mag Reson Med. Melbourne, Australia. 2012. Metastatic workup of a morbidly obese patient with colorectal cancer. Appl Radiol.